The Road to Avalon comes paved with handsome intentions. 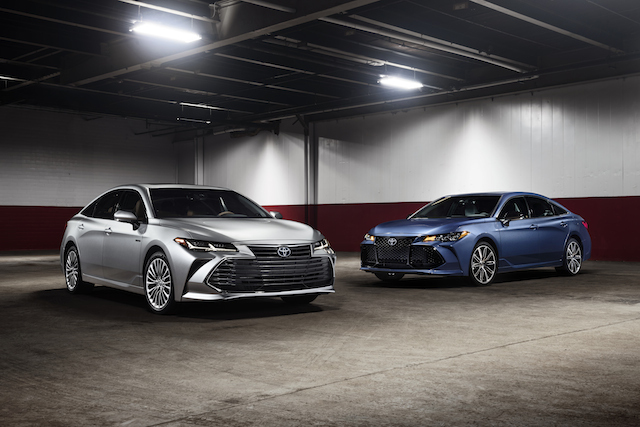 2019 Toyota Avalon (l) and Avalon Hybrid (r) models. Sales of large sedans have tanked in recent years, falling faster than other car segments as consumers beat feet to crossovers. Manufacturers such as Hyundai (Azera) have abandoned the segment while others, such as Ford (Taurus) and GM (Chevrolet Impala and Buick LaCrosse), may follow. 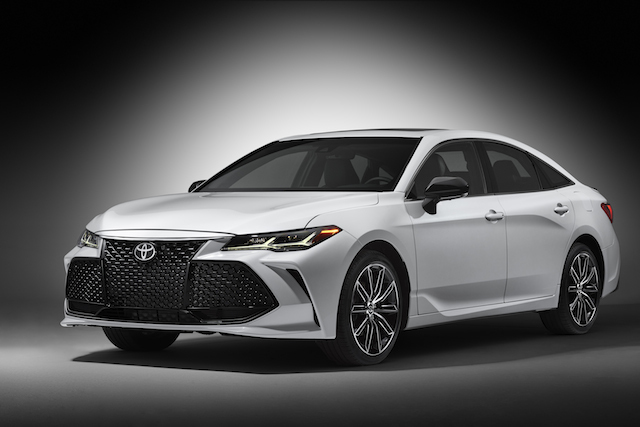 Toyota, fresh on the heels of an all-new midsize Camry sedan is staying with its Avalon entry and has, in fact, developed the next-generation model to roll out in the second quarter. Despite sales falling by a third last year, Toyota believes this American designed and built sedan has a following worth preserving. At the 2018 North American International Auto Show (NAIAS) in Detroit, the 2019 Avalon made its debut. Based on the automaker’s TNGA K Sedan Platform, representing a stretched variant of the Camry’s architecture, is what supports the new model. The big sedan comes with a multi-link rear suspension and the brand’s first adaptive variable suspension. Updated powertrains, the latest technologies and a standard driver-assist package are among the Avalon’s chief highlights. The Avalon’s new look is stunning, offering a handsome, low-slung layout that runs contrary to the model’s more pedestrian expression to date. It’s a purposeful change, aligning with the language Toyota describes for its “mid premium” sedan — perhaps to position it better to take on the threatened LaCrosse. Lexus styling cues, especially with the grille, is evident. Notably, from front to back the Avalon looks very much like a Lexus, which has us wondering where the automaker will go with the similar ES sedan. But Lexus is not the focal point of this story, Toyota is. And that has us digging for information that may perhaps shed some light on where this front-wheel drive only sedan is heading. Indeed, what still has us scratching our heads is why an all-wheel drive option isn’t offered, as Ford and Buick supply. The two powertrain choices offer a familiar displacement, but they reflect a generational shift too. 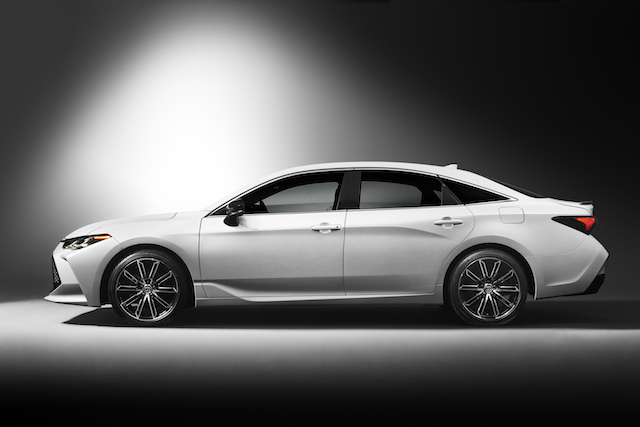 As before, you’ll find gas-powered and hybrid variants of the Avalon with a 3.5-liter V6 engine moving the standard sedan. Power routes to the front wheels by means of an 8-speed automatic transmission. Toyota hasn’t released performance numbers yet, but in the 2018 Camry, the V6 packs 301 horsepower and 267 pound-feet of torque. Thus, it seems reasonable to deduce the 2019 Avalon will deliver similar numbers. The Avalon Hybrid continues with a 2.5-liter four-cylinder Atkinson-cycle engine. In the Camry Hybrid, it combines with the electric generator to deliver 208 total system horsepower. Here, the drivetrain utilizes a continuously variable automatic transmission. The new Avalon is the most stylish one yet. 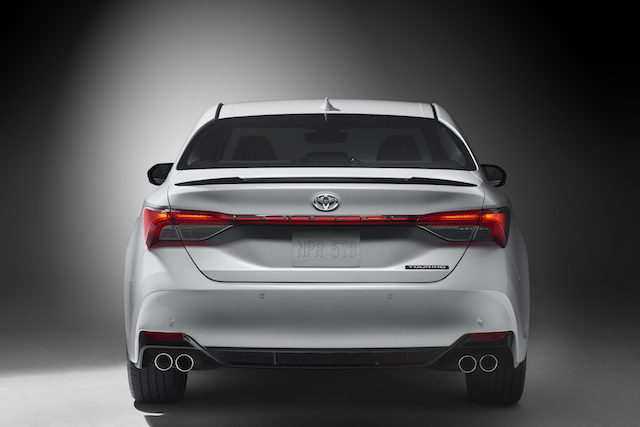 Beginning in 2019, the Avalon expands to four grades for the standard model and three for the hybrid. The all-new XSE kicks things off, followed by the Touring, XLE and Limited. The hybrid comes in XSE, XLE and Limited grades. Trim differentiation includes engineered wood on base models and real wood on the Limited. Aluminum pieces grace XSE and Touring models, while all models either have SofTex (imitation leather) or real leather seats. Color choices and quilting set apart the top trims from the rest. Premium tech features grace the 2019 Avalon. Toyota’s Entune 3.0 telematics system represents next-generation connectivity by means of Bluetooth hands-free calling, music streaming and Siri Eyes Free. Integrated navigation with maps, traffic reports, fuel price comparison and other apps extends its usefulness. HD Radio, satellite radio and Scout GPS are part of the JBL audio system with eight, 12 or 14 speakers, depending on the trim. The Avalon is available in four trims; three for the hybrid. All models receive Toyota’s 9-inch capacitive touchscreen center console display where pinched and flicked commands control the screen, just as you do on your smartphone or other personal devices. Toyota says the system operates faster than the outgoing arrangement with improved voice recognition. One sore point with Toyota products in recent years has been smartphone connectivity. This year, Toyota begins to rectify the problem by adding Apple CarPlay, but not Android Auto. Toyota must have found a way to protect propriety information from Apple, but not Android. At least for now. Under the Toyota Safety Sense P (TSS-P) umbrella, Toyota bundles a suite of driver-assist safety technologies. TSS-P comes standard, allowing the Avalon to outperform its rivals. The package includes a pre-collision system with pedestrian detection, full-speed range dynamic radar cruise control, lane departure alert with steering assist and automatic high beams. But that’s not all! You’ll also find blind spot monitoring with rear cross-traffic alert and a back guide monitor. Separately, Toyota also offers a panoramic view monitor and what the automaker calls “intelligence clearance sonar,” which includes a rear cross traffic braking system. You have a choice of imitation or real leather seats in the Avalon. Most 2019 Avalon models have a three-mode drive select diet — Eco, Sport and Normal. Touring models come with Eco, Normal, Sport/Sport+ and Custom modes. The all-new adaptive variable suspension system, exclusive to the Touring edition, brings in real-time damping control for improved controllability and sharp handling. The system controls shock responsiveness at the corners, detecting sudden changes in vehicle movement and road conditions to ensure a smooth ride. With a thorough overhaul of its flagship sedan, Toyota serves notice that it hasn’t abandoned the segment. Indeed, Toyota may be gauging a gradual shift in consumer sentiment away from crossovers and back toward cars. Even if consumer tastes do not shift, the automaker remains poised to capture customers left hanging by competitors who exit the market. In this case, the pie may yet shrink, but Toyota’s slice stands to widen. Quad tips, anyone? Avalon Touring edition. Photos copyright Toyota Motors. All rights reserved.